Preheat oven to 325°F. Coat a 9-inch springform pan with cooking spray. Tightly wrap the outside of the pan bottom and sides with heavy-duty foil to help keep the water bath from leaking into the cake. Put a kettle of water on to boil for the water bath. Grind cookies and 1/3 cup walnuts to a fine meal in a food processor. Drizzle in oil and process, scraping the sides as needed, until the crumbs are evenly moistened. Press the crumb mixture firmly into the bottom of the prepared pan. Place the pan in a roasting pan and set aside. Clean the food processor. Beat cream cheese, granulated sugar, brown sugar and pumpkin pie spice in a large bowl with an electric mixer on medium-low speed until the spice is incorporated. Increase speed to medium-high and beat until completely smooth, scraping down the sides occasionally. Beat in eggs one at a time, scraping down the sides occasionally. Beat in vanilla. Process cottage cheese in the food processor until completely smooth, about 2 minutes, scraping down the sides once. Gradually beat the cottage cheese and pumpkin puree into the cream cheese mixture on medium speed. Scrape down the sides and beat a final time to make sure no streaks remain. Pour the batter into the crust. Pour enough boiling water into the roasting pan to come 1 inch up the side of the springform pan to create a hot water bath for the cake. Carefully transfer the roasting pan to the oven. Bake the cheesecake in the center of the oven until it’s set around the edges but the center still jiggles slightly, 1 1/2 to 1 3/4 hours. Remove the roasting pan from the oven. Let the cake cool in the water bath until the water is room temperature. Coarsely chop the remaining 2/3 cup walnuts. Toast them in a dry skillet over medium-low heat until fragrant, 3 to 5 minutes. Remove the pan from the water bath. Remove the foil. 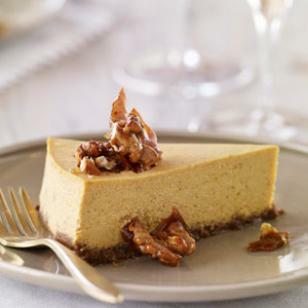 Place the nuts decoratively around the edge of the cheesecake. (Alternatively, turn the nuts into Candied Walnuts and decorate just before serving; see Variation.) Refrigerate, uncovered, until very cold, at least 4 hours. Wrap tightly and refrigerate overnight if desired. To serve, remove the sides of the pan. Transfer the cheesecake to a cake stand, if desired. Variation: To make Candied Walnuts: Line a baking sheet with parchment paper or foil; coat with cooking spray. Combine 1/4 cup sugar, 1 tablespoon honey, 1 tablespoon water and 1/4 teaspoon salt in a large heavy skillet. Place over medium-high heat and cook, stirring occasionally, until the mixture turns golden, 3 to 4 minutes. Add 2/3 cup walnut halves, reduce heat to medium-low and cook, stirring, until deep golden brown, 2 to 3 minutes more. Turn the mixture out on the prepared baking sheet, spreading in an even layer. When completely cooled, break into clusters. Per serving: 307 calories; 16 g fat (5 g sat, 4 g mono); 70 mg cholesterol; 33 g carbohydrates; 19 g added sugars; 10 g protein; 2 g fiber; 295 mg sodium; 270 mg potassium. To prepare custard: Whisk 1/2 cup milk with cornstarch in a medium bowl; set near the stove. Whisk 3 eggs, 1 teaspoon coconut extract and 1/4 teaspoon salt in another medium bowl. Combine the remaining 2 1/2 cups milk, coconut milk and 2/3 cup sugar in a large saucepan. Heat over medium-high heat, stirring occasionally, until steaming but not bubbling. Whisk the hot milk into the cornstarch mixture, then return the mixture to the saucepan and bring to a full boil over medium heat, stirring constantly. Gradually whisk the hot milk into the egg mixture. Strain through a sieve into a bowl or storage container. Cover and refrigerate until cold, 4 hours or up to 2 days. To prepare cranberry filling: Combine cranberries, cranberry juice, 1 cup sugar and honey (or agave) in a large saucepan. Cook over medium-high heat, stirring often, until most of the cranberries burst open, 7 to 10 minutes. Let cool to room temperature. Or transfer to a storage container and refrigerate for up to 2 days. To prepare sponge cake: Preheat oven to 350°F. Line a large (12-by-16 1/2-inch) rimmed baking sheet (half sheet pan) with parchment paper. Trim the paper so it covers the bottom of the pan completely, but does not curl up the sides. Coat the paper and pan sides with cooking spray. Place 5 eggs (in the shell) in a stand mixer bowl or large mixing bowl, add very warm tap water and set aside to warm the eggs and bowl. Melt butter in a small saucepan over medium-low heat, swirling occasionally, until the white flecks of milk solids in the bottom of the pan start to turn golden brown, 4 to 8 minutes. Scrape into a medium bowl. Let cool to room temperature, then stir in 2 teaspoons coconut extract. Set aside. Meanwhile, whisk whole-wheat pastry flour and cake flour in a medium bowl; set aside. Drain the water and break the eggs into the warmed mixing bowl. Add 2/3 cup sugar and 1/2 teaspoon salt and beat with an electric mixer on medium-high speed until tripled in volume and very pale light yellow, 5 to 15 minutes (depending on the strength of your mixer). To test if it’s beaten well enough, lift the beater from the batter: as the batter falls off the beater into the bowl, it should mound for a moment on the surface. Gently fold the flour mixture into the egg mixture with a whisk, in two additions, until just incorporated. Gently fold about 1 cup of the batter into the reserved butter. Then gently fold the butter mixture into the bowl of batter with a whisk until just incorporated, being careful not to overmix. Spread the batter evenly in the prepared baking sheet. Bake the cake until puffed and a toothpick inserted in the center comes out with a few moist crumbs attached, 8 to 12 minutes. Cool in the pan on a large wire rack for 10 minutes. Gently run a knife around the edges and turn the cake out onto the rack; remove the parchment and let cool completely. 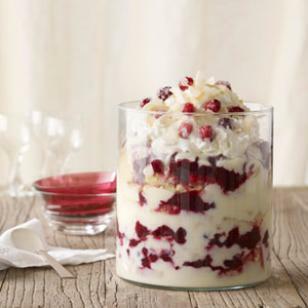 To assemble trifle: Cut the cake into 1-inch cubes. Spread about 1 cup of the custard in the bottom of a trifle dish. Top with about 3 cups cake cubes and 1 cup of the cranberry filling. Repeat the layering 3 more times. To prepare topping: Just before serving, whisk or beat cream in a large bowl until soft peaks form. Whisk in yogurt, confectioners’ sugar and 1 teaspoon coconut extract until smooth. Spread over the top of the trifle. Garnish with coconut. Tips: Agave syrup or nectar is the naturally sweet juice extracted from the agave plant. It has a lower glycemic index and is lower in calories than table sugar, but is even sweeter. Use it in moderation when substituting for table sugar. Look for it near other sweeteners in large supermarkets and natural foods stores. Whole-wheat pastry flour is milled from soft wheat. It contains less gluten-forming potential than regular whole-wheat flour and helps ensure a tender result in delicate baked goods while providing the nutritional benefits of whole grains. Find it at large supermarkets and natural-foods stores. Large thin flakes of dried coconut called coconut chips make attractive garnishes. Find them in the produce section of large supermarkets or at melissas.com. To toast, cook in a small dry skillet over medium-low heat, stirring constantly, until fragrant and lightly browned, 2 to 5 minutes. Per serving: 356 calories; 10 g fat (6 g sat, 2 g mono); 111 mg cholesterol; 60 g carbohydrates; 39 g added sugars; 7 g protein; 3 g fiber; 180 mg sodium; 175 mg potassium. Copyright © 2019 Austin Veggie Chef.